If you have ever had your tarot cards read, you know it can be fun, informative and eerily accurate. Whether you sought them out yourself or partook in a reading at a social function, like a bridal shower or birthday party, you likely earned something. if you are thinking about getting your cards read, you should. Nagging questions, unsure about your job or your love life, or just curious, you can get that all answered. The tarot reader doesn’t have the power to alter your future events, but they can help you see clearly and prepare for change and your future. A love tarot reading can give you all the important information you seek for your relationship. Let’s take a closer look at love tarot readings. 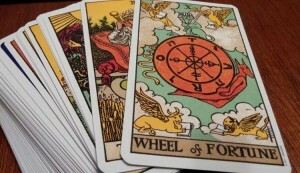 A deck of tarot cards is made up of 78 cards, each with its own meaning. The cards are dealt out and the meaning for your future is divined through the cards ad their meaning. It doesn’t always mean that it will happen, but rather gives you a glimpse of what can happen if you take no action in your own life to alter the sightings. Your psychic has no power over the cards that are dealt, only the power to understand their meaning and relay that message to you. The cards all have different meanings and even the same card can a different meaning for different readings. That’s why you need a professional to help you sort it all out. Here’s an example. Right? This is the ultimate card for love and relationships. It represents a strong bond between two people based on trust and respect. This card also represents a strong, committed bond between two people. Love and respect for two. This card means love and family. It means completion of family values and love. If you get this card but don’t yet have a family, it could mean you will have one day. This card shows the happiness and joy for a new relationship. New love, new beginnings, and pure happiness. It can signal a new relationship that has already started or is about to start. Although it is called Knight, it can represent man or woman in your life and shows you are being wooed and courted by someone special. It’s a knight in shining armor for the new world. Although the cards have their own specific meanings, the meaning is more clear to you as you are having your love tarot reading. There are different types of tarot card reading, so if you are looking for answers about love, you will want to specify that. There are also question readings, where you have questions you want to be answered or open readings, that cover more general areas or if you are entering a new phase of your life, like marriage or a new job. A love reading is done to help you see your love relationship more clearly. If you have questions about your relationship, if you are happy and want to know if things will continue into marriage or if you are worried about your future together, that can all be answered with your love tarot reading. Again, the cards show you what might be, where you are at if you don’t change the situation. If you are happy with the love tarot reading, you can simply get on with living your life and be confident that all will work out. If your idea of a tarot card reading is a woman with incense burning and long flowing robes, you may be disappointed. Psychics, diviners, and readers are just like everyone else and normally don’t use gimmicks and costumes. If you are asking questions, keep them open and remember, they are for a guide, so avoid yes/no type of questions. It’s best to leave all expectations behind and open yourself to the experience. Keep your mind and opinions open and your questions open. It’s important for you not to be openly skeptical and open yourself to the flow of the reading. You are asking about love, after all. Your love tarot reader will shuffle or cleanse the deck of cards. They will split the deck into usually three piles and maybe ask you to pick one. This will allow you to see that the cards will come out of the deck randomly but truthfully. Then they lay them out as they fall in the deck. There is no trickery or magic involved, just the cards show themselves as your truth. As the cards fall into place, your tarot card reading will explain what they all mean and how they work together with the rest of the cards showing. These cards have their own meaning, but it is what they mean to you that is important. For instance, if the first card out is the death card, that is not usually a bad thing. it can mean the death of an old flame but also new beginnings and the hope of starting over. It’s important that you are honest, as well as open during your reading. Keep in mind they are not performing magic and are not always going to be completely accurate on all things. They will help guide you without telling you what to do. If you keep your mind open and relax and enjoy yourself, you will learn a lot about yourself, your future and ways in which you can grow and change your life and your situation in order to find the true love you want and deserve. If you are seriously considering a reading, try a call-in reading. You can stay at home and be comfortable and still get all the information you need. The answers are in your cards, but it’s all up to you to decide what to do with this information.